This place is for the birds… Literally. Recently reopened, some of the paths in the wildlife refuge and its access road had sustained damage from last year’s Hurricane Sandy and a series of coastal winter storms. I had stopped here late in February and it was still closed. After making the phone call to see if it were open, I made my way here. Starting from the parking lot I decided to head south first along the Ocean View Loop to Sachuest Point. I immediately came across several red winged blackbirds and several yellow birds that almost looked like parakeets. 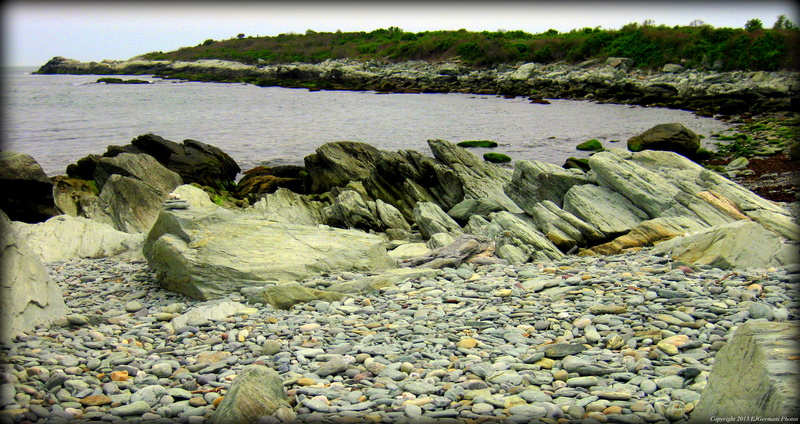 I then spent a little time down on the rocks at the point. I continued along the path coming across some wildflowers and many more birds such as robins and catbirds. I decided to take a short trek on to the Price Neck Overlook that has good views of the Sakonnet River and the Atlantic Ocean. In the distance the Sakonnet Lighthouse is clearly visible. I then continued along the loop path and onto the Flint Point Loop passing through areas of beach roses. Along the way there are a couple of overlooks. The first overlooks the Island Rocks where you will see several birds relaxing. I saw an egret here. The second overlooks Flint Point as well as the coast of Tiverton and Little Compton across the river and Middletown and Third Beach to the left. I then continued the path which leads back to the parking area. Along the way I came across mourning doves. There is a visitor center here that has quite a display of the birds and other species that are found here. Beware, however, of the over abundance of poison ivy here.